Vintage Mattel 1950’s Jack in the Box – Jolly Tune the Clown. 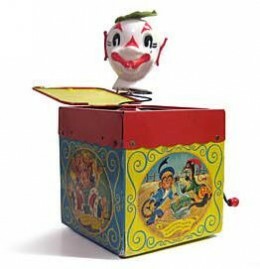 Arguably one of the creepiest toys ever made is the ‘Jack-in-the-box’, and more specifically those early vintage Jack-in-the-box’s created by Mattel. A Jack-in-the-box is a children’s toy that consists of a brightly coloured box within which sits a clown or other figure. The box features a crank which when turned usually plays a melody (often ‘Pop Goes the Weasel’) and at the end when this tune has finished playing the lid springs open and out pops ‘Jack’. Mattel has been responsible for producing some of the best examples of the Jack-in-the-box since the companies founding in 1945, and has been producing numerous and varied Jack-in-the-box toys ever since. As a child I was the proud owner of a vintage Mattel Jack-in-the-box and it was a treasured toy to be treated both with respect and with caution. There is something a little unnerving all in all about the Jack-in-the-box as a child’s toy, and in the same way that these days many children are terrified of clowns, it is easy to see how the jack-in-the-box could install the same fear, and it is this that adds to the unique attraction I feel for these vintage Mattel toys. After all, in French the Jack-in-the-box is known as ‘diable en boît’ meaning ‘boxed devil’. Vintage Mattel Jack-in-the-box collectors would love to get their hands on one of these 1952 model vintage Jack-in-the-box’s designed by ‘Bob Routledge’. The detail of both box and doll is exquisite and makes for a perfect example of an early Mattel Jack-in-the-box. * The U.S. Fast Food restaurant chain of the same name uses a Jack-in-the-box toy clown as its mascot. * ‘Zebedee’ from the popular children’s TV show ‘The Magic Roundabout' is a Jack-in-the-box that has lost its box. Another 1950's vintage Mattel Jack in the box 'Jolly Tune' the Clown. His box is made of stiff cardboard or wood and features illustrations on each side with the words from popular children’s songs. ‘Jolly-Tune’ the clown wears a felt hat and a red and white polka dot shirt and was designed by ‘Bob Routledge’. * Pre-owned Jack-in-the-box’s (especially clowns) regularly feature damage to the nose due to it scraping against the edge of the opening as it pops out. * In an episode of ‘Family Guy’ when the family is at the toy store, Lois says she has something for Stewie, to which Stewie remarks "Oh, let me guess, you're going to give me a box with a crank that you expect me to turn and turn until "Oh!" A jack pops out. You laugh, and the dog laughs, and the kids laugh, and I die a little more inside..."
these things still give me the creeps. There was always one hanging around somehwere. Horrible, eerie and altogether freaky. And that awful plink plonk noise that was part of the music mechanism. *shudder* I just found this post...I was looking for something else, but now here I am..I distinctly remember when I was 5 or 6 visting my Grandparents. They had a jack in the box in with a bunch of other old creepy broken toys, dolls that say "mama" when you pull the string and that sort of stuff. I HATED that thing. The music, the clink clink, the anticipation of this scary faced clown suddenly flinging out at you. It scared me every time it popped out, but I would keep turning the crank. I would cry and cry, trying to turn the crank slooooowly, hopeing it wouldn't pop out. I thought, if I could get to the end, and it didn't pop out, I could stop. My Mom thougt it was hillarious. I cant believe they still exist, and with sock monkeys too! creepy!!! I've always found these toys to be suspect. I can't hazard a guess as to who the demographic would be for, as I'd imagine after witnessing the contraption once I would quickly tire of it. I don't find these boxes scary at all, never did. 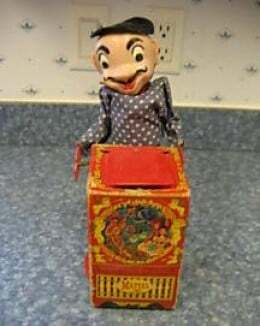 I had the original Mattel Jack in the Box when I was 3 or 4 years old - 1951-52, it never scared me and I was a kid that didn't like sudden, loud sounds such as fire crackers. The only thing I did, being the ever curious kid that I was, I broke the music mechanism trying to find out what makes the music, and what makes the clown pop up. LOL. I'm happy to say, I've just bought another one on E-Bay just like my original one - and it works perfectly!